I never knew it until living in our rental house in Kansas, but it’s actually really easy to grow plants, if you do so outdoors. Turns out, nature knows what to do to make the magic happen. 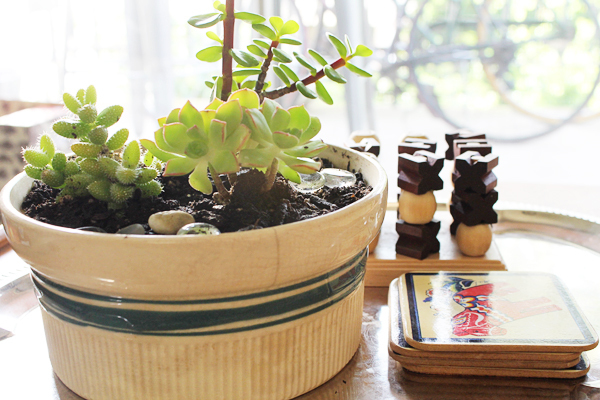 About six months ago, it was literally a stem broken off of our neighbor’s larger jade plant. We stuck it in some water and waited… and waited… until it sprouted a root. Then we put it in this pot I stole from my mom’s backyard, with some soil we stole from a planter bed in the complex common area. The rest is history. It’s literally four times larger than it started. The baby-plant vibrant green is gone (sad face) but the plant is going bananas. I took one of the succulents out since it was getting so crowded. The hen and chick plant now lives in its own vessel, a pretty pitcher I picked up at West Elm on clearance for about $5. I’m going to see if it survives OK on the coffee table, but the apartment is a bit dark so if it starts looking sickly, the move will be made back to the patio. I also bought a couple more plants at Lowe’s a few months when my mom came down for the day. My favorite plant at our Kansas house was a Wandering Jew, but I left it behind since I was skeptical it would make the move OK. Now, I have Jew, Part Two! I love that it came in a hanging basket. Back in Kansas, our friends had an awesome backyard that everybody simply referred to as, “The Patio.” Café lights were strung up at the beginning of March and it became the go-to spot for all gatherings throughout the spring and summer. In an effort to bring a little bit of “The Patio” to our new balcony, we strung up café lights the day we arrived (I was extremely proud of myself for being able to swiftly locate them in the jungle of to-be-unpacked boxes) and put our folding chairs up outside. The chairs are not the greatest in quality, in fact we picked them up around this time last year at Target, clearanced for $4 each. 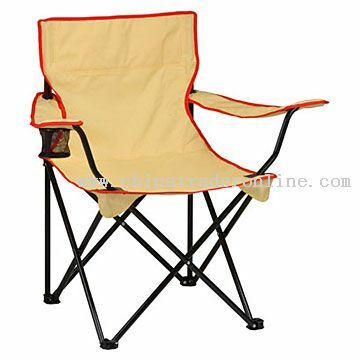 I am not a fan of those ubiquitous plastic backyard chairs nor have I ever been a fan of the fold-up camping chair (comfortable, sure, but they look ugly to me). So, although our chairs might threaten to fold up with you still seated inside, they look iconic and remind me of childhood summers. Perhaps later this fall as summer items continue to get clearanced, we may upgrade. But for now, I like these little guys. The World Market rug that has followed me from place to place since 2006 may have found its final resting place here on the patio. We will see how the (admittedly mild) weather treats it. While we have an awning over the balcony, the rug did get rained on for the first time ever last week. The day I put my reservation deposit in on this apartment, I set foot in West Elm for the first time (after spending countless hours poring over their catalog and website) and grabbed the blue dipped pot on sale. I am still trying to think of the perfect plant to put in it. The pot has no drainage hole in the bottom, so recommendations are much-appreciated. Additionally, we hung up the nautical souvenir we got on our honeymoon in Maine, a Moroccan-inspired lantern (full disclosure: purchased in Dallas) and the Tibetan prayer flags Doug picked up for me at a flea market in London. These little bits and baubles were secured using zip-ties, much like the chicken wire that eases my neurotic mind (in regards to Mosey poking his head out underneath the rails). Looking up from a distance (usually from the hot tub) and seeing these efforts at personalizing our space makes me smile. Although the company is different, at night, with the lights on, it does bring to mind The Patio back in Kansas. And the memories are good.